Find a vacation home to rent in Eigersund Municipality from our list of vacation rental properties. Campaya has over 11 vacation homes available in Eigersund Municipality, which give you the possibility to locate a unique accommodation in Eigersund Municipality which completes your check-list in search for the perfect self catering vacation apartments in Eigersund Municipality or vacation villas in Eigersund Municipality. Welcome to this great holiday house with a wonderful location directly by the fjord. The place can offer very good fishing and bathing opportunities from your own pier. Welcome to a holiday home with panoramic views and great location by the bay. Excellent fishing throughout the year, both from boat and from land. Beautiful apartment in the basement, not far from the water. Excellent for fishing and swimming, the nearest beach is only minutes away. Fishing from land possible. 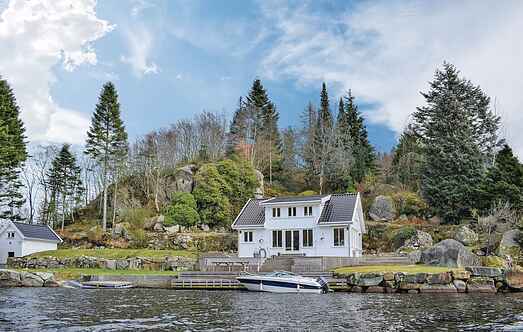 This wonderful holiday home is located by the coast in Egersund. Are you looking for a vacation to enjoy peace & quiet together with fishing and swimming in the sea? Then this holiday home is perfect due to its undisturbed location. A nice holiday home in a great location not far from the sea and with a great view over the ocean. The house has its own pier with boat and very good fishing and swimming possibilities. A nice holiday apartment with a great and secluded location. Here you can enjoy your holiday with a lovely outdoor area and terrace with barbecue and garden furniture. Large and beautiful holiday home with everything you need for a successful vacation. On the large terraces you can sunbathe, relax and grill. Nice and cozy apartment in the basement of the owners house, in a fantastic location right down the fjord. The apartment has a beautiful outdoor area with barbecue and garden furniture. Large and beautiful house with everything you need for a successful holiday. On the large terrace you can sunbathe and relax in the jacuzzi.